OLD GROWTH REDWOOD, with its beautifully rich colour and grain, reasonably good weatherability and resistance to insects had always been a popular material for use in the production of outdoor products. The abundance of redwood in California made it the wood of choice for outdoor decks and outdoor furniture during most of the twentieth century. 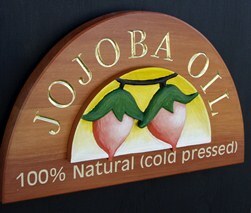 Redwood and a similar wood called Western Red Cedar was also used extensively in the production of handcrafted signage. The beautiful, rust-colored wood was soft enough to carve or to sandblast, had a beautiful grain and was relatively durable when covered in a good paint or clear coat. A clearcoated redwood or cedar panel gave a warm natural background to chisel carved and gold-leaf gilded letters (see below). A sandblasted and painted redwood panel or cedar displayed a very distinctive and artistic grain pattern (see below). But Redwood varieties like Coastal Redwood and especially Sequoia Redwood are the world’s largest trees. Native to California and Oregon, old growth redwood trees take at 200 - 300 years to mature, can live 1000 years and may reach a trunk diameter of 35 feet. Because of this extremely slow replacement and re-growth period supply did not keep up with demand and commercial harvest of old growth trees for decks, furniture and signage was eventually recognized as unsustainable. Varieties of faster growing redwood trees (90 year maturity) have been developed but these new growth trees have a very wide grain pattern [ large gaps between the growth rings due to faster growth] making ‘new growth’ redwood OK for outdoor furniture and decking but less desirable for sign carving and much less attractive for sandblasting. Old growth redwood is now protected and harvesting is strictly regulated. 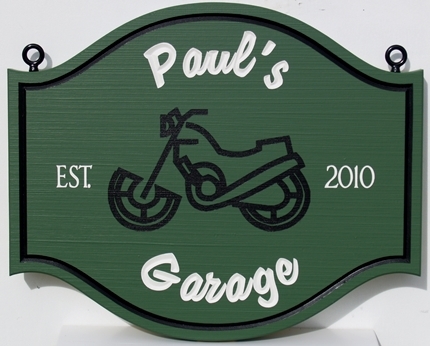 While redwood and cedar signs are still produced on a small scale, the finished sign requires regular maintenance to keep it from warping, cracking and splitting. Even the most weatherable woods like Redwood and Western Red Cedar will eventually have these problems in outdoor use. Because of serious sustainabilty and weatherability issues many sign makers and much of the dimensional sign market have chosen to move to a more contemporary substrate called High Density Urethane (HDU). This closed cell foam is an extremely resilient faux wood material and is used today for both carved signs and sandblasted signage. 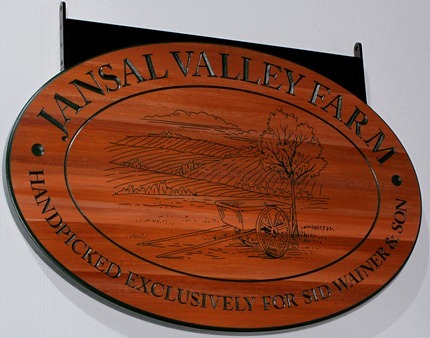 The sign below is an example of a 'faux redwood' sign made of a weatherable HDU/PVC panel which was hand carved and hand grained by Danthonia artists and artisans. Exact sign life depends on a number of factors including UV exposure and weather conditions. But all things being equal an HDU sign like this can last 2-3 times as long as a wood sign before any refurbishment is required. Another advantage of HDU 'redwood style' signage is that unlike redwood HDU has no grain. 3D scuplted add on components can be incorprated into the sign design withour fear of splintering during production or cracking when outdoors. Of course even in the old days the vast majority of carved redwood signs were coated with several layers of stain block, primer and then exterior paint to give the best longevity. When choosing an HDU alternative specify 'brush texture' and your painted HDU sign will look identical to a painted redwood sign. See Below.